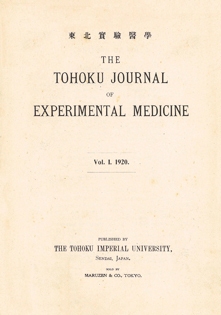 The Tohoku Journal of Experimental Medicine was founded in 1920. The TJEM is open to original articles in all branches of medical sciences. The TJEM also covers the fields of disaster-prevention science, including earthquake archeology (News and Views). its 100th anniversary in 2020.
to publication averages 20 days (June 20, 2018).